At 16, Timothy Dalton saw a performance of Macbeth on stage, and decided then that he would be an actor. After high school, Dalton worked with the National Youth Theatre in London. He even attended the Royal Academy of Dramatic Arts, but he didn't like it and left. He remembers a class where students "learned to walk about the stage like ballet dancers", and says it "took a year to undo the psychological damage that was caused by the oppressive teachers". On stage, he earned good reviews acting in plays by William Shakespeare and Eugene O'Neill. He has also done a great deal of television work, some great (the 1978 miniseries Centennial with Richard Chamberlain) and some not-so-great (he played Rhett Butler in Scarlett, the awkward TV sequel to Gone With the Wind). 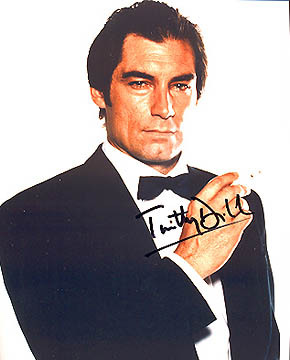 Dalton is best known for playing James Bond, in The Living Daylights and Licence to Kill. His was the most serious Bond, and after Roger Moore's seven increasingly slapstick 007 films, the character needed to be serious again. Dalton portrayed the spy as someone stuck in a job he didn't particularly like. The Living Daylights did brisk business, but for Dalton's second Bond film the producers tweaked their long-running and generally successful formula. Bond was now motivated by a personal vendetta instead of an assignment from M, and he fought the war on drugs instead of the usual "national defense" hokum. The tone was different, and even the title had to be dumbed down -- Licence to Kill was originally Licence Revoked, until a studio survey confirmed what executives suspected, that half of Americans didn't know what the word "revoked" means. For whatever reasons, the film bombed, and it was six years before another Bond film was made, with Pierce Brosnan replacing Dalton. He also appeared in The Lion in Winter with Katharine Hepburn and Peter O'Toole, and played Mae West's husband in Sextette. His other films include Brenda Starr with Brooke Shields, The Beautician and the Beast with Fran Drescher, and Looney Tunes: Back in Action with Brendan Fraser. His ex-wife Oksana Grigorieva made headlines in 2010 as the scorned and threatened ex-lover of Mel Gibson. Birthdate given as 1944 or 1946, mainly because of conflicting statements Dalton has made about his age.